BALTIMORE - March 14, 2019 - PRLog -- God has provided us with the natural nutritional resources needed to fight disease and to maintain maximum health. Now you are able to have 20 to 30 fruits vegetables and berries per serving incomplete shakes powder capsules gummy chewables and fruit bars. This whole food nutrition has the scientific research in the medical journals to prove it. Ask about the healthy family Start program where kids can receive free food for 4 years. We are dedicated to Bringing healthy back and inspiring healthy living. 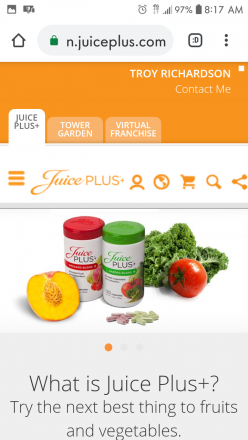 What is Juice Plus+? This is directly from the Juice Plus+'s Official Website, the site describes Juice Plus+ as the "Next Best Thing To Fruits and Vegetables". The site also describes Juice Plus+ as "Juice Plus+ products are made from the juice powder concentrates and oils from more than 40 different fruits, vegetables and grains. While Juice Plus+ isn't a substitute for eating fruits and vegetables, our whole food-based products support a healthy diet by offering a much wider variety of naturally occurring vitamins, along with antioxidants and phytonutrients found in fruits and vegetables. Every Juice Plus+ product is made from quality ingredients grown farm fresh, providing the natural nutrients your body needs."